Car #3 is typical of the type of cars used by systems in colder climatesfrom coast to coast to clear snow from tracks located in paved streets. Known as “snow sweepers”, these cars carried large spinning brooms that literally swept the snow off of the tracks, allowing service to continue during even the worst winter weather. Sweeper #3 at Branford, CT with restoration nearly completed. Matt Nawn photo. Most trolley systems in Pennsylvania had at least one snow sweeper on their roster as many towns and cities required the electric railway companies to maintain the streets they laid their tracks in, including snow removal. 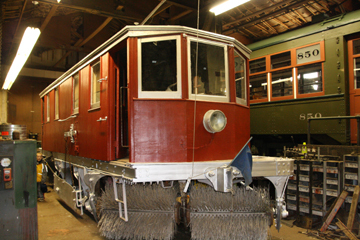 The last transit system in the United States to use a snow sweeper to clear its tracks was New Jersey Transit, where a 1920s vintage sweeper was used to clear snow from the tracks of the former Newark City Subway (home of the museum’s PCC car #6) into the first decade of the 21st century. Car #3 was built in 1911 as car #102 for the Mason City and Clear Lake Railroad by the McGuire-Cummings Manufacturing Company of Chicago, Illinois. This was the only sweeper owned by this railroad, whose primary purpose in later years was the handling of freight by interurban electric locomotives. The Mason City and Clear Lake Railroad was merged into the Iowa Terminal Railroad in 1961, and the car was renumbered #3 at that time. 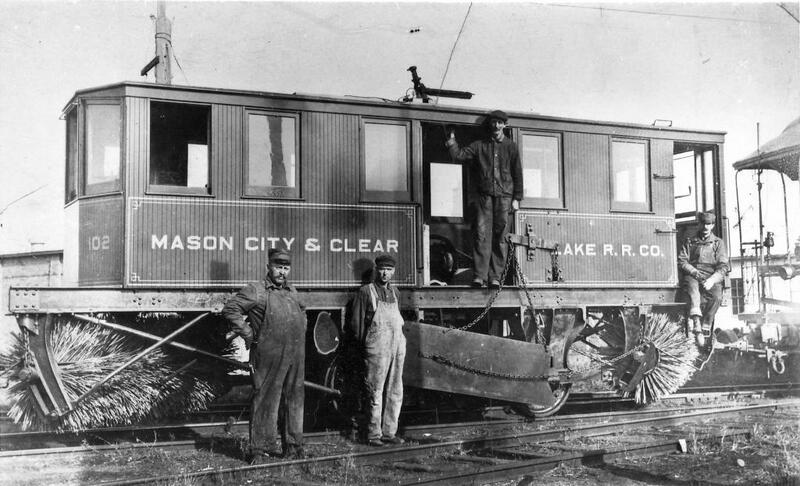 Sweeper #3 when it was new and posed with workmen on predecessor company Mason City & Clear Lake Railroad Company. Note the fancy trimwork painted on the sides. Also note the repeater gong had not yet been installed, nor a permanent headlight. The pole is not in its base, probably because the car shipped without it. Unfortunately, no date or photographer noted, but the photo likely dates near to the year it was built: 1911. Unlike many systems from where our cars originated from, the Iowa Terminal Railroad, reorganized as the Iowa Traction Railroad, remains in operation as the sole entity providing freight service in the United States with interurban electric locomotives and is the longest continuously operated interurban railway in the United States, having been in operation since 1897. 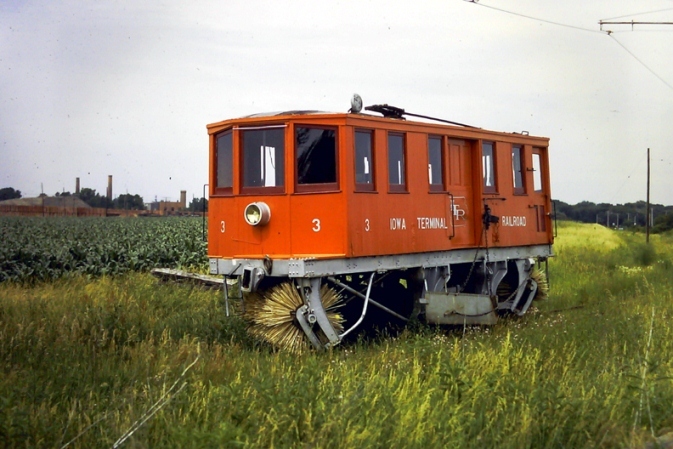 Sweeper #3 in Emery, Iowa in 1967. RTY Library Collection. The primary use of car #3 in its later years of service was clearing of snow from the remaining street trackage in Clear Lake, Iowa. 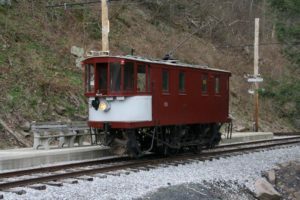 The car was used infrequently after abandonment of the last street trackage in Clear Lake in 1967 and the car was donated in 1973 to the Midwest Electric Railway Museum in Mt. Pleasant, Iowa. 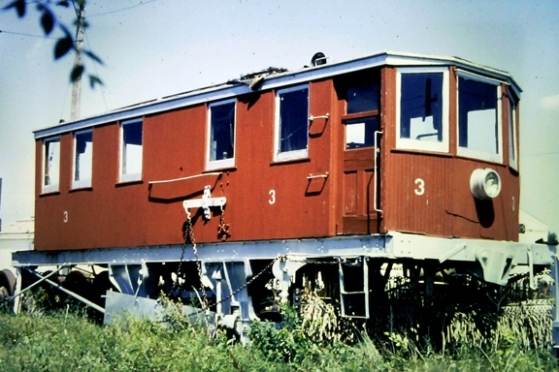 From 1989 until 2005, car #3 was owned by the Iowa Trolley Park near Clear Lake, Iowa. Iowa Terminal #3 suns itself in an Iowa field on July 4, 1971. RTY Library collection. With this work nearly complete in 2011, representatives from National Capital Trolley Museum asked Rockhill Trolley Museum if they would consider a trade of former DC Transit snow sweeper #09, which had been at Rockhill Trolley Museum since the end of streetcar service in Washington, DC in 1962 and had been cosmetically restored in 1999 by Rockhill Trolley Museum volunteers. In a spirit of cooperation and good will, Rockhill Trolley Museum traded former DC Transit #09 to the National Capital Trolley Museum in exchange for former Iowa Terminal #3 and a pair of Brill 27F trucks suitable for future use under Valley Railways car #12 in 2012, 50 years after the end of streetcar service in Washington, DC. 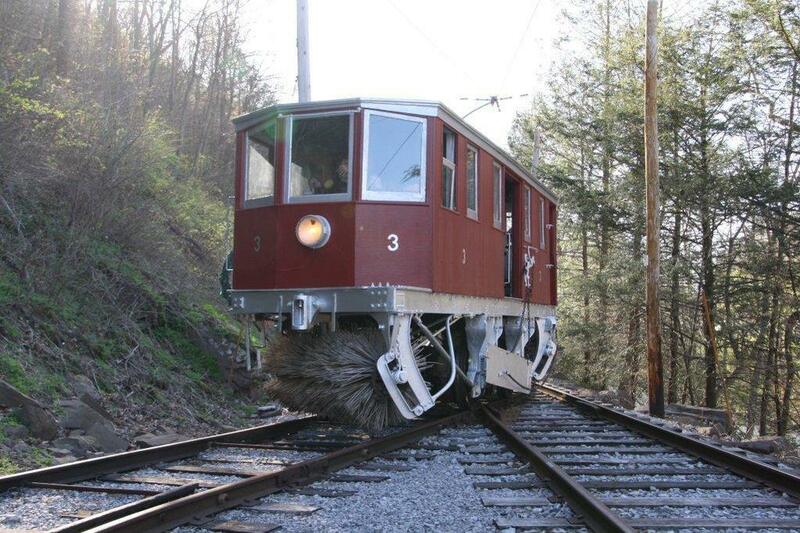 Car #3 is much better suited to operation at the Rockhill Trolley Museum due to the profile and condition of its wheels. Car #09 is now displayed in operating condition at the museum closest to its “home”. DC Transit #09 on its last trip to Blacklog Narrows at Rockhill Trolley Museum, 2011. Cars similar to #3 operated in many Pennsylvania cities, including Altoona, Carlisle, Johnstown, Harrisburg, and areas served by the Red Arrow Lines. Rockhill Trolley Museum is proud to be the latest owner of this interesting and historic car. From Chicago to Iowa to Pennsylvania via Connecticut, car #3 has a unique story to tell museum visitors. Read more about DC Transit Sweeper #09 in the press release.